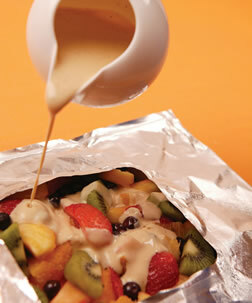 Prepare fruit and keep refrigerated in Qbag™ just before cooking. On the BBQ: Pre-heat BBQ to Medium. Cook for 5 mins. Arrange the food in the bag and add any seasonings or sauces. TO CLOSE: Fold the open end twice and press down carefully. Place the Qbag on a baking tray for the oven or on the BBQ with the window facing up. Leave to cook. Bag may inflate and excess steam will automatically vent around the window area. Peel back the window film to stir or taste. TO ROAST: Remove window film halfway through cooking. After cooking, leave to stand for 10 seconds before removing the window film using the tab. Serve & enjoy! For a STEAMED, succulent result, leave the EasyView Window in place during cooking. If you prefer a GRILLED or ROASTED result, allow to cook for 5 mins, then remove from the heat source and peel off the EasyView Window before returning to cook. This will allow food to brown off on top. If cooking pork, lamb, beef in the bag - it is recommended to use a marinade or sauce to add moisture and maximise flavour. Prepare meals in advance, place in the fridge/cooler/freezer and cook when ready to eat. Experiment with seasoning blends, dry rubs, marinades, BBQ sauce, spice & herb mixes etc. for extra flavour and succulence. Qbag and its contents will be hot after cooking, use oven mitts / utensils to handle / serve. Always use a supporting plate to carry the Qbag after filling and cooking. Take care when handling, the foil may be sharp. Single use only. Recycle or dispose of after use. Maximum temperature in in an oven: 210°C (400°F). When cooking on the BBQ/grill, keep the BBQ/grill hood up to allow air to circulate around the bag. Be sure to fully remove the EasyView Window before closing the BBQ/grill hood. Always keep the EasyView Window facing upwards - do not turn the bag upside down. Maximum cooking time: 2 hours. Make a hole in the top of the bag for steam to escape before opening. Add a tblsp. of flour inside to soak up extra moisture if preferred. No temperature restriction in an oven or on a BBQ/grill. What is Qbag made of and how does it work? Qbag is made of a very strong, pure aluminium foil (with no coatings or laminated plastics on it) which is also much thicker and stronger than regular household foil. This is why it can withstand the high temperatures and flames from a barbecue. The bag provides a pressure-cooking environment for food to cook faster by steaming in the oven and on the barbecue, without any odours escaping or mess to clean up after. How do I close Qbag after filling? This is very easy to do by hand. Fold the open end by 1cm or so, twice, and press down to create a water-tight seal. No need for any expensive sealing machinery (unlike what sous-vide demands). Add sauces, marinades or even white wine to enhance flavour. Do I need to pierce the window film before cooking? No. The window adheres to the aluminium foil bag during freezing and room temperatures. During cooking, the window film will gently lift off to allow excess pressure and steam to escape automatically. However, it will not ‘pop’ off or reseal to the aluminium foil. It will simply ‘sit’ on top of the bag, so just leave the bag to cook without turning it over. Can I roast in the bag? Yes. During cooking, after the window film has begun to let steam escape, you can choose to leave the window film resting on top of the bag for a steamed, succulent result or remove it altogether (with the EasyPull tab) for a more roasted result. Will I still get the taste from charcoal on the BBQ/grill? Yes, you can! A few minutes after cooking the window will start to become peelable. Remove the window film altogether to allow you to close the BBQ hood. The food inside the bag will infuse with the smoke (or wood chips) from the BBQ to get the charcoal taste, but without the mess! Can I add vinegar or lemon juice for flavour in Qbag? The cooking method of Qbag allows for the natural water content in food to be released for steaming, the release of all this moisture is likely to neutralise acidic and alkaline elements present inside the bag. That is why lemon slices on salmon or a splash of vinegar in a marinade for meat can be used for seasoning and flavour, but probably should not be cooked in isolation in the bag. Can I prepare meals in Qbag and cook them later? Yes, absolutely! Meal prepping is well-suited to Qbag because you can see inside the bag through the EasyView Window. You can keep meals in Qbag in the fridge, cooler (like when camping) or in the freezer. If you have a question that is not answered here, please contact us to help directly.